When you are a one car family, a girl has sometimes got to get creative when a donut craving kicks in! 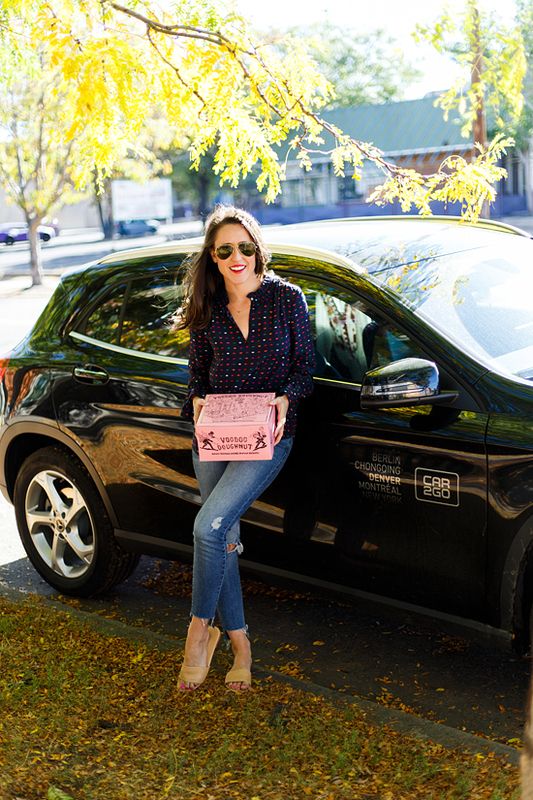 I partnered with car2go + Localeur to share 3 of my favorite Denver spots & first up is Voodoo Doughnut! You might know them for their crazy flavors (Bacon Maple!? Voodoo Doll Doughnut!? ), & yes they have plenty of wild ones, but also serve up lots of other eye catching + yummy options too! Find Voodoo in the middle of Colfax Ave, nearby other favorites like Illegal Petes + many vinyl shops & dive bars to round out a perfectly hipster afternoon - if it isn't on Insta, it didn't happen! If you haven't downloaded the Localeur app yet, you are missing out! I use Localeur when I travel to a new city to find local spots, specially recommended by verified locals. Heck, I use it here in Denver too as I am still learning about all of the hidden gems of the Mile High City. I used to contribute to the Nashville Localeur page, & know that all contributors take great joy in sharing local spots to fellow locals and visitors alike so that you can truly experience a city like you live there! I have just recently discovered the magic that is car2go. They have a fleet of Mercedes Benz sedans & SUVs that are super luxurious + easy to use! I guess I expected ride sharing to be a little grimy + a lot of hassle, but all of my car2go experiences have been exactly the opposite! Our favorite neighborhood, RiNo, always has lots of car2go cars parked within walking distance, & I feel quite a bit like James Bond walking up to a car and letting myself in. 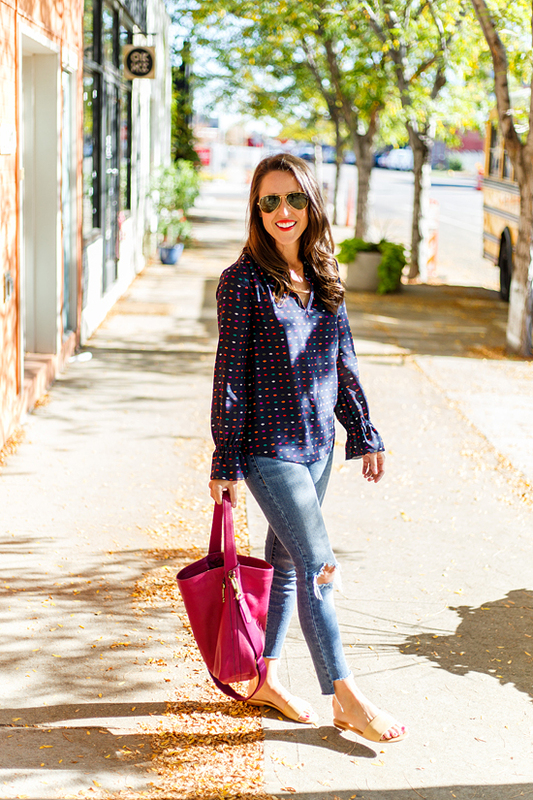 This outfit was perfect for a recently sunny Fall day here in Denver - I might sound like a broken record, but let me proceed to explain how everyone of these items is my FAVORITE! I have a hard time dropping $88 for a single shirt, but I am trying to retrain myself to live by my "fewer, better things" motto. This shirt is amazing - from the bell sleeve details, to the flirty lip print, + optional neck button - that I don't feel guilty wearing it on repeat. 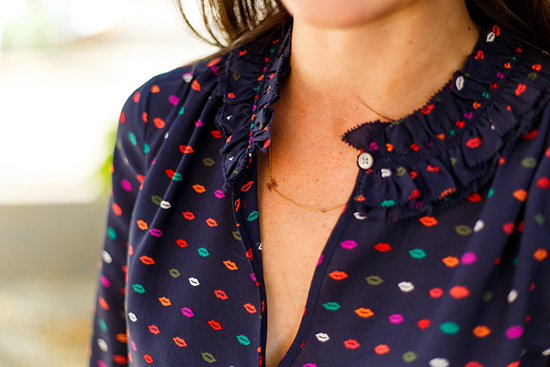 This blouse was spot on for a recent blogger brunch (with velvet heels! ), under my puffer vest for an afternoon of watching football at a sports bar, & with distressed jeans for boutique hopping on a lazy Sunday. While I might be a reluctant trend trier, one trend I have jumped on HARD is distressed denim, & now I am adding a high/low hem to my jeans & feeling like I am so LIT... are we still using LIT? These jeans have the perfect amount of stretch, the light wash is refreshing & they work great for petites! When it comes to Fall accessories, I am currently all about a bold purse and understated jewelry. 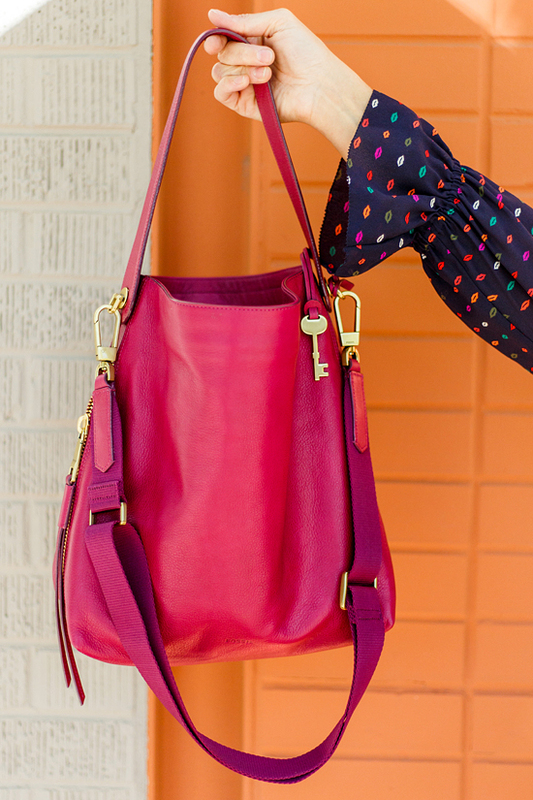 This Fossil hobo bag comes in 4 perfect for fall shades, but I'm a little biased and think my cranberry color is the best! Looking to add extra storage to your larger purses? I swear by these Mulberry & Grand canvas pouches. 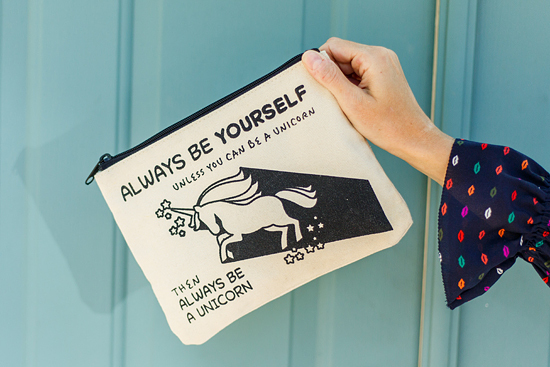 I have the unicorn one, but might have to also pick up this SASSY one! I've had my M monogram necklace since I took my man's last name almost 4 years ago, but scooped up this minimalist monogram style necklace for a few girlfriends on my Christmas list already, like the good little elf that I try to be. necklace: old monogram necklace - I'm love this minimalistic monogram style for Christmas gifts! stripes, I can't quit you!